We all like to take vacations. Unfortunately, for one reason or another, vacations frequently wind up as stressful experiences. With some prudent planning, you can lessen the financial stressors for your next excursion. Here are some tips for you to think about for your next excursion. For starters, you want to consider where you would like to go. If you are not sure, at least know if you will be leaving the country or not. Also, if possible, narrow down the dates for when you would like to execute your adventure. Once you know these items, enter them into your calendar, preferably an on-line sharable one, so you make sure you don't double-book an important date. Now that you have your dates and where you are going picked out, here are some things you can do now so you are not rushing as the date approaches. Renew any licenses or passports well in advance. The fee for expedited passport processing is $60, which is on top of the $110 renewal fee. Renew now and save $60 per passport. Also, if your Driver's License will expire while you are away, renew it before leaving to avoid the hassles associated with an expired Driver's License. Register for Global Entry. Even if you do not intend on traveling outside the United States, I recommend applying for a Global Entry Card. TSA Pre-Check is part of the privileges granted with Global Entry and the cost is only marginally higher ($85 vs. $100). However, the Global Entry interviews are MUCH less crowded than the Pre-Check ones - you can make an appointment, so there is virtually no waiting time. Also, once you have your Global Entry Card, you can go through the expedited Pre-Check line at TSA...any minute or hassle (keep your shoes on) you can save at TSA is worth $100 (or more). Trust me, Global Entry is well worth the investment. You can read more about it here. Vaccinations. If you are going anywhere requiring any sort of vaccination or other medical-related procedures, make appointments and get that done now. As the travel date approaches, you don't want to deal with doctor's offices that are "all booked up". Car Servicing. If your car is in need of repairs or maintenance, plan ahead to get those things done so you are in a properly serviced vehicle when you travel. If in doubt, replace it....think battery and tires. If you have not read my previous past regarding saving for variable expenses, please have a look here. Hopefully, you are setting aside a bit of money each month for travel. That way, when the time comes, you have ample funds for your trip. You may not be able to cover ALL the expenses; however, you want to have enough so you have happy memories about your experience instead of painful monthly reminders from the credit card company. Three of the most expensive pieces of most trips are (i) Airfare; (ii) Accommodation; and (iii) Transportation at the Destination. Obviously, these factors are highly dependent on where you intend on going. When possible, I suggest looking to book these items well in advance. According to cheapair.com, the ideal time for booking Airfare is 70 days prior to travel. Also, consider booking directly with the airline you intend to use. If weather becomes a factor, dealing with the airline is far easier when you have purchased travel directly instead of though an aggregator like Expedia. There are many websites (kayak.com for one) to price compare. Make sure to make an allowance for "Resort Fees", "Booking Fees", and "Taxes"....the price on the website is just the basis upon which other fees are based. For rental cars, you may be able to get a lower rate if you pay in advance. Also, bigger cars may be cheaper, though of course gas will be more expensive...these variables depend on where you are going and when. While cheaper rates might be available if you wait, there is comfort in knowing you will get to where you are going, have a way to get around when you get there, and have a place to sleep too. 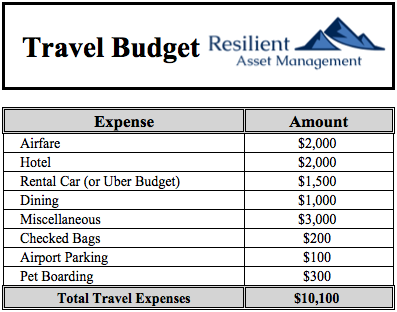 So if you like certainty in your travel, sacrificing a bit on price may decrease your stress a bit. Packing. Think light and minimal. Remember, the 50 pound limit is strictly enforced now, so you don't want to overpay or have to shift items between bags - who likes doing that? Instead, take a minimal amount of stuff...a general rule I read somewhere was take half the clothes and twice the money. I won't chalk that one up as a recommendation, though I will say to keep it in mind when packing. Cell Phones. Most carriers have some sort of an arrangement for overseas travel, so you will likely be able to stay connected while away. Make sure to inquire about Data Plans and if you will be charged for roaming where you are going. And also, be weary of updating your phone's software if you are outside the United States...your phone may require you to connect with your provider's cell towers, which will be impossible overseas. This could render your phone potentially useless - trust me, I have it on good, very good, authority that this can happen. Credit Cards. Typically, credit cards offer the best exchange rates for foreign currency. That said, be sure to check if your issuer charges foreign transaction fees...these can really add up. If your issuer does charge foreign transaction fees, apply for a card that doesn't...there are plenty of them out there. Also, if you have automatic payments arranged on one card you regularly use, consider using a different card on travel. That way, if your card is compromised or lost, you don't have to sweat reseting all your automatic payments. Virtual Private Network (VPN) Software. While you are away, you may be tempted to use Public Wi-Fi. In the past, this was a big security no-no. Now, however, you can purchase software (and an app) for your computer and phone that allows you to set-up a Virtual Private Network for your use, thus making Public Wi-Fi much more secure. Without going into too much detail, this software encrypts your transmissions so anyone monitoring the connection is seeing jibberish. VPN software is affordable and well-worth the investment. Personally, I use ExpressVPN and have been quite satisfied with it. Health Insurance. If you are venturing outside the United States, your medical insurance may not provide coverage for you while you are away. Be sure to check with your provider. If your insurance is not valid overseas, purchasing temporary coverage is generally affordable. You can check rates and information here. When the time finally comes to go away, you should have all your administrative items (Air, Hotel, and Car) taken care of and a good chunk of your vacation already paid for...congratulations. And even better, some of the costs you typically have - groceries come to mind - aren't needed, so you should have a few extra budgetary dollars to spare. And finally, if you are using a special travel credit card as I suggested, you can happily charge items while you are away and enjoy the short "float" period you get during your credit card billing cycle. That could give you up to one more month to pay your bill. While you are away, it is the time to relax and recharge. You have a travel budget, so don't fret about spending on things you otherwise wouldn't - there is more to life than scrimping ALL the time. If you are looking forward to poolside service, do it. Lattes in the morning, get on your caffeine high. 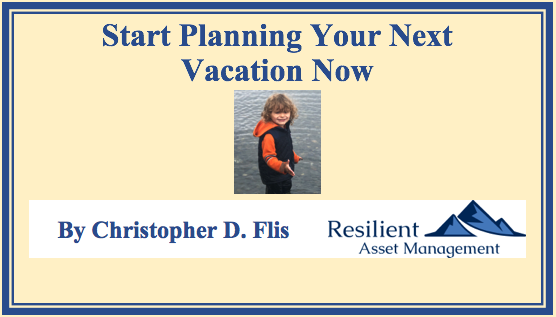 Set reasonable limits, and remember, a vacation is not an ideal savings opportunity. Hopefully your trip is an enjoyable and memorable one. When you return, you will have some more bills to pay, though they ought to be covered by your previous (and perhaps the next month's) travel savings. And then you can start planning your next excursion experience.